Find items in Cable Zone that meet or outdo the standard electrical and thermal properties. If you want the job done safely the amazing StarTech.com Serial DB9 RS232 Extender over Cat 5 - Up to 3300 ft (1000 meters) is the right choice for you. Embark on excellent journey through the cabling zone with StarTech.com and find the perfect products for your system. Our assortment for cabling and accessory is capable of of supporting robust infrastructure. Find more interesting products and others that go beyond the ordinary: Tripp Lite - N320-05M - Tripp Lite Duplex Multimode 62.5/125 Fiber Patch Cable - (LC/LC), 5M (16-ft.), StarTech.com - ST121UTPDVI - StarTech.com DVI Video Extender over Cat 5 UTP and C2G (Cables To Go) - 27137 - 100ft Cat6 Snagless Unshielded (UTP) Network Patch Cable - Gray - Category 6 for Network Device - RJ-45 Male - RJ-45 Male - 100ft - Gray. 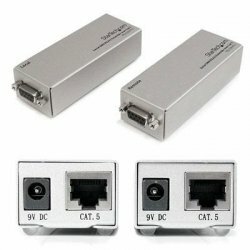 The RS232EXTC1 Serial over Cat 5 Extender allows you to increase the distance of your RS232 Serial connection by up to 1000 meters (3300 feet), giving you the ability to connect serial peripheral devices up to a kilometer away from your system - an incredible 65x greater than normal RS232 serial cable length restrictions would permit. The Extender is a cost-effective serial extension solution and completely hardware-based, eliminating the need to install additional software, allowing for a completely plug and play installation. The hardware can be setup in minutes, using existing or new Cat 5 or better Ethernet cabling. Perfect for use in industrial monitoring and control, POS, security, medical, and traffic flow applications, the RS232 Serial over Cat 5 extender maintains the RS232 standard with support for data transfer rates of up to 230 Kbps. Backed by a StarTech.com 2-year warranty and free lifetime technical support. There is something remarkable here for everyone, browse our selection. Find reassurance in the fact that our inexpensive range of products will last you for years. Whether you need an air of sophistication or just practicality, you will appreciate our choice of surprising items. Here you can find fantastic items. Find a huge variety of similar personalized products bellow. If you have any questions, don't hesitate to contact our Customer Service department, after all, they are here for you. For a large variety and more related pieces, please visit other sub-categories for anything you need.